I have been trying to prove my 30 yrs with JWO. I have found a 1990 roster from JWO with name on it. Now I must wait another year for my jacket. Gerald, any chance that you could share that roster. I am in the same boat. I was a member starting in 1984 and dropped out for one year around 1998. That roster would likely have my name on it. Any help is appreciated!! Yep, Seems funny that you could find the 1990 roster but they couldn't... I've been a member since 95 or so I guess. When we moved I finally decided to get rid of all the JWO Magazines I had kept since the beginning along with a huge bunch of old car mags. I had heard about the jacket so I kept the oldest one I could find and recycled the rest. ( I know, but I've seen others try to sell them on this site and no bites). Now I can't find that oldest one! I too am interested in how you found that roster, Gerald. Well, I just tried to go on the Olds Club site and couldn't. I got a new password from them but it still isn't recognized. Well I sent them a message and see what they say. I'm guessing the old rosters are on there??? When OCA started the long term membership program, I sent them original rosters from the mid to late 1970's. They did not request anything newer. I thought they already had everything from the 80's and newer. I've been a member since 83,35 years. I had all of my JWO's for proof. I may be missing a couple of issues but I did have the first. I have a roster somewhere and will try to see if I can find it. OK Nik,I found a 2003 OCA Directory and I found your name. It does not give your date of membership.. My OCA # is 10596 and maybe if you posted your membership #,somebody who is also a long time member and has a joining date close to you,that might help verifying your long term membership. I have no idea why they didn't keep a record of membership dates. Last edited by 66-3X2 442; January 6th, 2019 at 11:25 AM. I did get on the OCA website with some help today, I couldn't find any old rosters, though it sounds like you guys sent some to them. My membership # is 026878 and I think I joined 1994 or 1995. If anyone can help that would be great but I'm not expecting or asking you to, I can see it could be a big hassle. My president has the 1990 roster. I can relay the message to him. If you fall between these I can help. Back in the day you could buy a number. Maybe y'all need to do like I did and tell 'em this is the way it's gonna be and that's that. They gave me a ration of chin music too to point I finally told them they could give me the jacket or not give it, I had more to worry about. Whoever was running that program at the time told me I was copping an attitude and that's when I dropped the bomb. Jacket came 3 weeks later. That gentleman found out some things about me and my time in OCA and on the BOD he knew nothing about, because he'd been listening to the wrong people. I've never been one to crow about myself, but I worked my *** off for ten years trying to develop the ASE Zone only to be told I hadn't done my job as a Zone director. All I know is after I walked away from it ASE went downhill quick. I wish that both current directors weren't from the same chapter because I'm not seeing any effort to develop the rest of the Zone. And no, even though I'm retired and have the time, I have no desire to put myself back in that rodeo. Tired of dealing with little tin gods, which I had enough of in the working world. I had the verification problem when they began offering the 30-year jackets. Fortunately I had my first OCA Membership Card; I sent them a copy and got a nice note in return recalling fondly the person who had signed the card. This was 10 years ago. By now, I know they have a good idea of your join date--just by your membership number--because so many people have verified in those 10 years. Granted, they don't know if you had a membership lapse, which your number would not reflect. However, they didn't bring up that possibility when I verified and I don't see how that could be a legitimate hurdle. There's no way to prove or disprove a lapse. Ask if you can have your join date verified based on your OCA number. I would have to dig my first JWO out but it was in the late 80's, I believe 1987. Member 17389. Am I a "documented" long term member.... lol. Sadly, I was to young to have a check book and income my dad got me the membership in his name. I have always keep it in his name just because of the membership number. I checked about getting the name changed but they would not do it. Last edited by jensenracing77; January 7th, 2019 at 06:19 PM. I seem to recall back in the DeNovi and Casteel days, OCA was re-using older member numbers for new members. When an older member dropped out their number was re-assigned to a new member. Can't verify this, only from a 74 year old memory. I know that is true. There are some members that joined several years after me with much lower numbers. I joined in September 1980. My membership number is 006418. I have no idea why they didn't keep a record of membership dates. I think a couple of us compared it to a toddler having a temper tantrum. The OCA had to rebuild their records from scratch. May have also involved the Magazine Editor. Been a couple of decades but likely someone else remembers the incident. This would have been done, maybe in the late 1980s or early 1990s? Yes, I believe that is correct. A few other clubs that I belong to did the same. Not sure why. Its not like there is a scarcity or rationing of numbers. Casteel should have been sent to prison for his dirty deeds. UP DATE: just got my OCA 30 year jacket today. very happy. I should get one this year. Not sure if it has a name on it but if it does it will have my dads name on it. When I started I was to young to have a checking account and my dad just got the membership for me in his name. After I took over I just kept it in his name all these years. I sent in the information a while back to prove the year I joined. I never heard anything back so I assume they got it recorded. Did you have to ask for the jacket or did they just send it? I should get one this year. Did you have to ask for the jacket or did they just send it? IIRC, received a form to complete and return indicating selection for size and I think choice of insulated or non insulated and where/what name. Enjoy your jacket. That may be as good as it gets. Back to pins for 35 years. 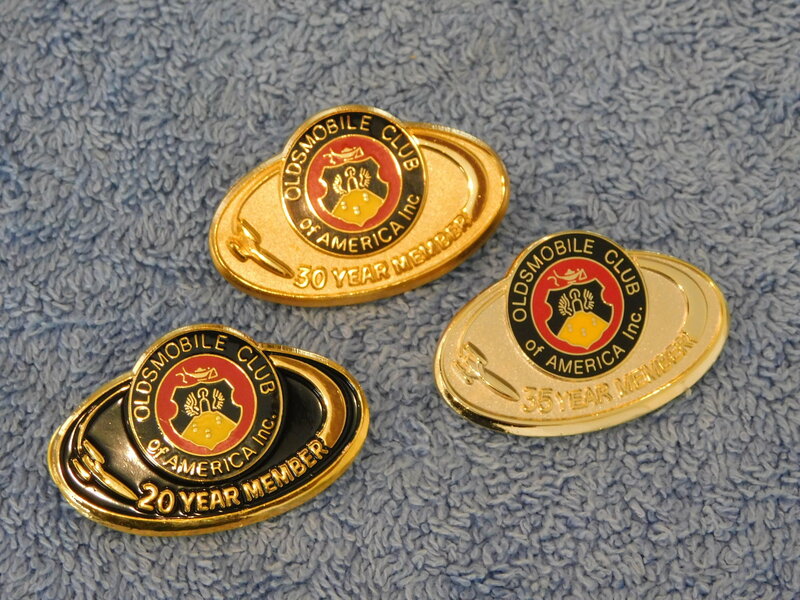 I’ve been a member since 1978 #5376 and I did receive my jacket but I would like to get my hat and lapel pins. I have contacted JWO several times but have not heard back from them. I joined sometime in the 90's but let my membership run out for probably over a decade. By default I'd say that voids my 30 years. Not sure how I could even prove I was a member back then. I may have some early issues of JWO in the attic but that's about all. I think it has to be 30 years continuos membership. The wife tracked down my oldest JWO which is 3-1997 so almost 22 years with member 29119. Just a rookie compared to most here. In speaking with Ken Nichols my zone rep, he mentioned in the by the way fashion, the club is struggling with the cost of the jackets, IIRC $60.00 and the number for each average is $6k-8k per year!